I guess it’s Q-week in Fels’s world. Always nice to have a theme. 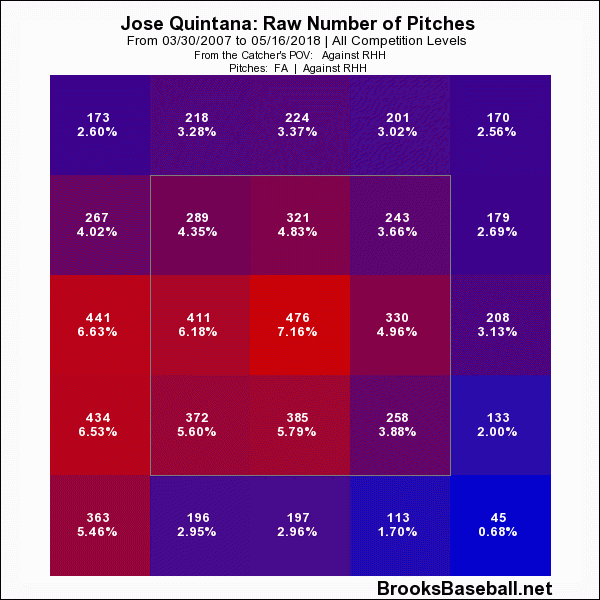 I’m not saying anything surprising when I say that Jose Quintana has been a mystery so far this season. While his start this year doesn’t look all that different than his start last year, because it’s taking place on the upper side of town instead of the side of town that most forget about, it’s getting a lot more attention. And the air raid sirens are going off. I wanted to do a deeper dive on what Q might be changing so far this year, as I did about a month ago. 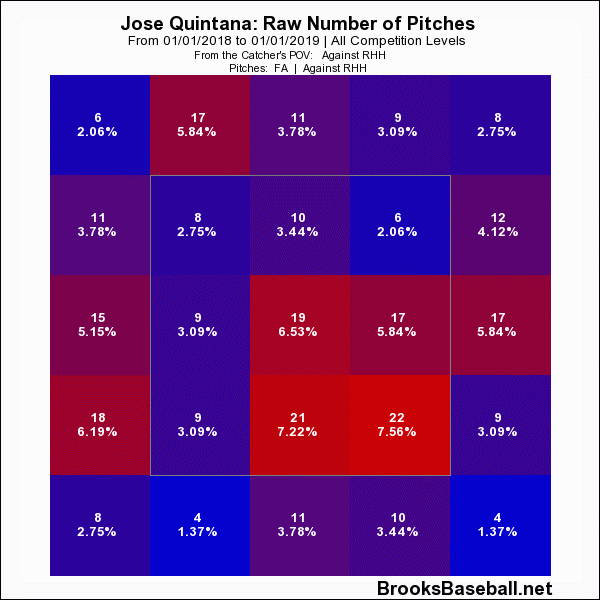 What’s clear to everyone is that Quintana is walking too many guys, and he’s throwing more fastballs than he has….well, ever. 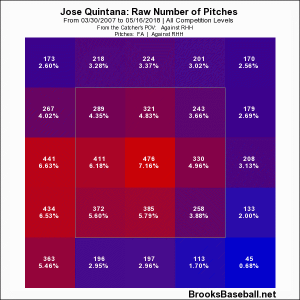 He’s throwing just four-seamers just about half the time, after only using the pitch about 35% of the time last year. It’s come at the expense of his cutter/sinker, which has seen a drop of 10% in its usage. As you can see, he’s throwing to the outside corner more than he’s trying for the inside corner. 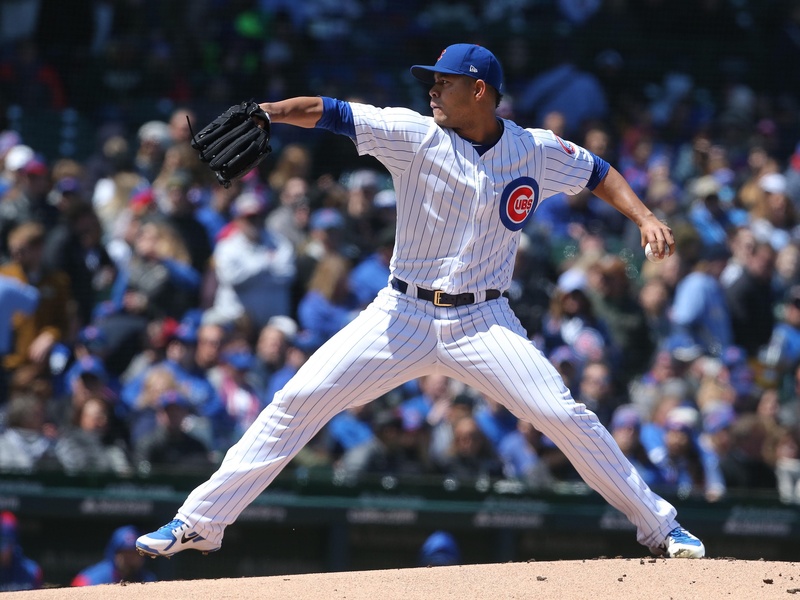 Now, we can’t really guess if he’s just missing this badly and is still trying to pour fastball after fastball into the aura of righties, or as we saw with Lester and other pitchers, he’s trying to use both sides of the plate more. Either way, he can’t seem to find a steady location or the plate on the outside corner. What you’ll see is that when Q has gotten his fastball high and tight to righties, he’s been safe. It’s when they can simply drop the head of the bat on the ball at their knees that he gets into trouble. 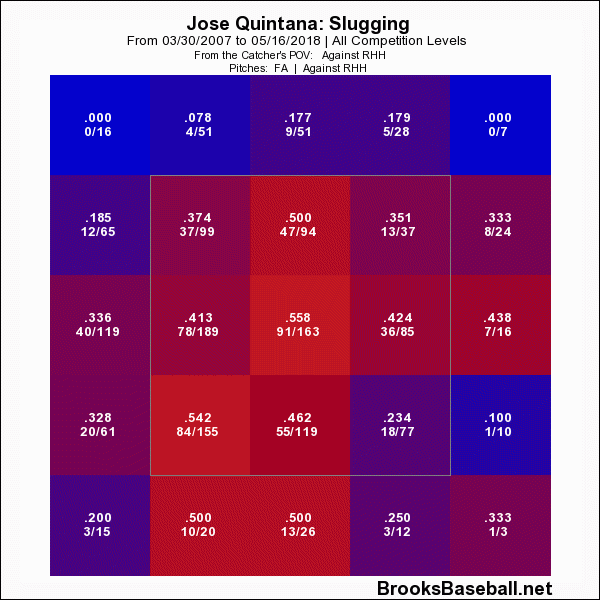 But going to back to the first two charts, he’s not throwing the ball up and in nearly as much as he did, trying to stay low in either to force grounders or at least get away from slugging. But given the environment today, it actually makes more sense to throw a four-seamer at the top of the zone, especially one with the life Q’s has. 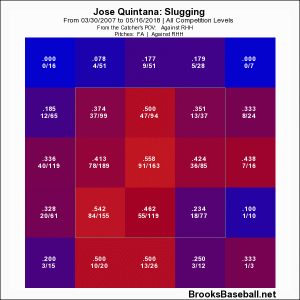 His lack of attacking the top of the zone might be why his infield-fly rate has been cut in half from last year. There are other problems, of course. He’s throwing his curve for a strike about 10% less than he did last year. But going away from what has worked and trying something new seems to be the main problem. That and a hallucinogenic concept of the strike zone. 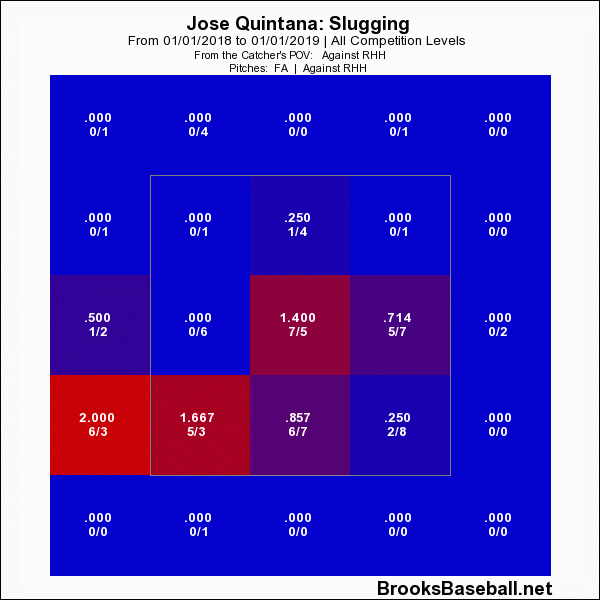 Perhaps this new approach for Q will click at any point, and he’ll start zeroing in on the outside corner at the knees and combine that with some tower buzzing high and in in the strike zone. Perhaps he just doesn’t feel like he’s got the feel for his cutter right now. But working only at the bottom of the zone and not finding the outside corner is causing red lights to blink at the moment on the dashboard.